I finally got a chance to go through this book twice, and I can honestly say that this is THE nail book. While I don't agree 100% with every piece of advice (I'll get to that), this is an excellent tool for people who want to take control of their own nail care and look as good as if they had a salon manicure or pedicure. The rest of the book is all useful how-to instructions and diagrams. That's right, actual information! I am really happy that this wasn't just one big advertisement for Rescue Beauty Lounge. I can't say so much for that awful Sephora book. Ji lists everything you need to know about sanitation and sterilization (that got me really excited! ), the basic manicure and pedicure, nail and cuticle care, polish techniques and how to make your polish last and also offers an entire program for nail biters who want to start over. One of the main points of this book is that you can take care of your nails at home. You don't need to be a slave to standing salon appointments, or feel like only a professional can make your nails look beautiful. This book contains not only step by step instructions on home manicures and pedicures, but recipes and suggestions for do-it-yourself hand, nail and foot treatments. You don't have to buy special products- you most likely have everything you need right in your medicine cabinet. I actually can't wait to try the Recovery manicure aimed toward nail biters. If you decide you still want to visit the salon for a manicure or pedicure, there's a chapter for that, too. It's mostly about salon etiquette, such as tipping and bringing your own tools, but also shows you how to avoid an unsanitary salon, and what to do if you're not happy with any aspect of your service. Among all the excellent advice and detailed descriptions, there are a few things I thought were lacking. The section on polishing your nails, which is emphasized as the least important part of the manicure, was surprisingly short and not exactly helpful. It describes the steps of polishing the nail, but doesn't really offer much information on proper technique. You can prep and prime and polish all you want, but if the lacquer isn't applied well it's going to look bad. Her method of polishing nails involves waiting for each coat to dry before applying the next one, and then applying a regular topcoat. If I had to do that, I'd probably never paint my nails. That just takes way too long for me. I can't live without my Seche Vite quick dry topcoat. I can paint my nails in 10 minutes or less and be ready to use my hands again in the same amount of time. I can't wait an hour for my polish to dry. The last tip that I thought was strange was to buff your nails before applying polish. Buffing is important, especially if you have ridges, uneven nails or stains, but it can really hurt the wear of the polish. If your nails are too shiny and smooth from buffing, the polish doesn't adhere very well and you end up with chipping and peeling way sooner than usual. Maybe this means you get a manicure more often, but if I had to use her time consuming polishing method I'd be pretty annoyed if my nail polish chipped and peeled the next day. Over-buffing can also weaken and thin your nails, so be careful not to buff too often or with too much force. Overall, this book offers excellent advice for anyone wanting to take care of their own nails. It can be a learning tool for people who haven't done it before, or a refresher course for nail veterans. It's not very long and is interesting enough to keep you reading. And, of course, I'm now dying to get a mani/pedi at Rescue Beauty Lounge. Just the thought of a clean, sanitary salon dedicated to true nail care, with private, peaceful rooms and employees trained by the owner herself, is enough to make me change my mind about doing all my manicures and pedicures myself. 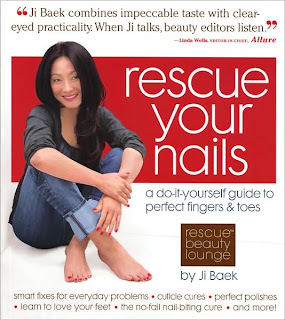 Rescue Your Nails: A Do-It-Yourself Guide to Perfect Fingers and Toes by Ji Baek is available from Rescue Beauty Lounge. Your review got me so excited that I had to click my way to RBL's site and put one of these in the cart together with a couple of polishes! Unfortunately for me, seems that they refuse to ship to Sweden as many other companies on the other side of the Atlantic. :( Frustration! Aww, I'm sorry Chaosophia! I'll see if I can find a site that carries both the book and the polish and ships to Sweden.... I think HQHair.com is European and has Rescue Beauty, but I don't know if they have the book. I'll be sure to let you know if I find something! Surprisingly, if you use a base coat after buffing your nails, the polish does not peel off but the pay off from buffing is excellent. It's so smooth and shiny. I can't do my nails unless i buff! It's very addicting but yes, it does add time to the process...which is probably why I wait so long between changing nail colors! It's funny b/c as the nails grow out you can see the arc of the old polish. I had this one lady rave about my nails because it looked like I had only painted my nails half way but it was actually the result of laziness on my part. I have had peeling after buffing, even with a base coat, but I'm sure some people have better luck than me! I've found that if you buff to a dull finish (as opposed to a shine) that the polish adheres much better and stays on longer. Personally, I can't buff often because I keep my nails quite long, and buffing weakens them. I do buff gently once or twice a month. That's funny about the old polish arc! I've noticed that before on my naked nails after wearing lots of dark, staining colors. Looked kinda cool, actually! I read your blog all the time and love it! I did a search on your blog about nail care. Your review of the RBL book came up and I'm thinking of buying it. But in the meantime, I have a nail problem I was hoping you could help me with... I've finally gotten my nails healthy looking and strong using treatments except for one thing: My nails are pretty yellow at the tips when they are bare with no polish. Is this because I need to let them "breath" once in while and not wear polish? (Aah, the horror!). Thanks for this review! I'm definitely going to get this, it sounds wonderful!